Gtir Motorsport club » General Discusion » Gtir related Discussion » A few dimensions please? Is there anyone out there with a gear stick+linkage assembly to hand? 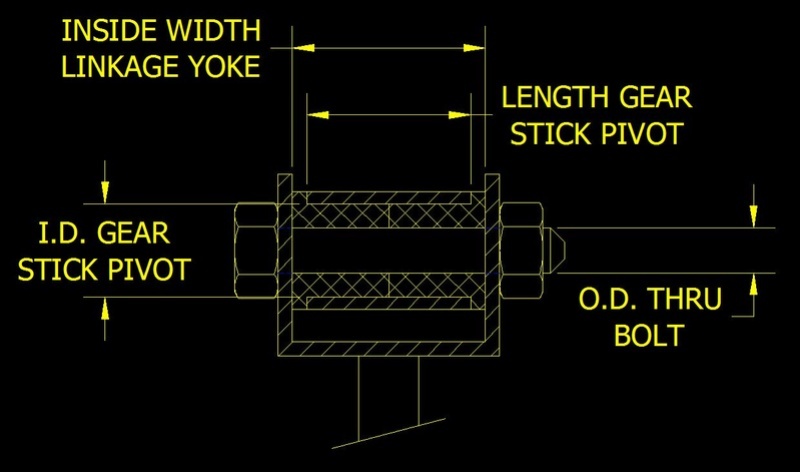 I'm after a couple of dimensions to see if I can suss out some alternative bearings for the connection between the bottom of the gear stick itself and the linkage rod that attaches to the box (see attached doodle). I suppose I could take mine off if no one has one handy mate. If it wouldn't be too much hassle for you, that would be much appreciated mate. Basically what I'm trying to replicate here is what was done in the link below. If I can get the dimensions required, hopefully I'll be able to size up radial ball bearings to replace the plastic top hat bushes on our gear linkages. The bearings mentioned here are £5.89 form RS Components so could work out even cheaper than poly bushes! I finally got round to fitting my super duper bushes to the gear linkage. As it turned out, the rear bush (bottom of the gear stick) was fine, as was the rear most bush on the 'UJ' that fixes to the yoke on the gearbox. It was the very front bush on this 'UJ' that had heaps of play in it. I ended up buying Nylon top hat bushes that had the correct OD (18mm) but a smaller ID, so I could manually open them out to the correct size. In hindsight I should have bought 'Oilite' bushes as they would have been easier to file down & adjust than the Nylon was. The exact bush you'd need is this 12x18x24x20x4 and open the ID out to 14mm. 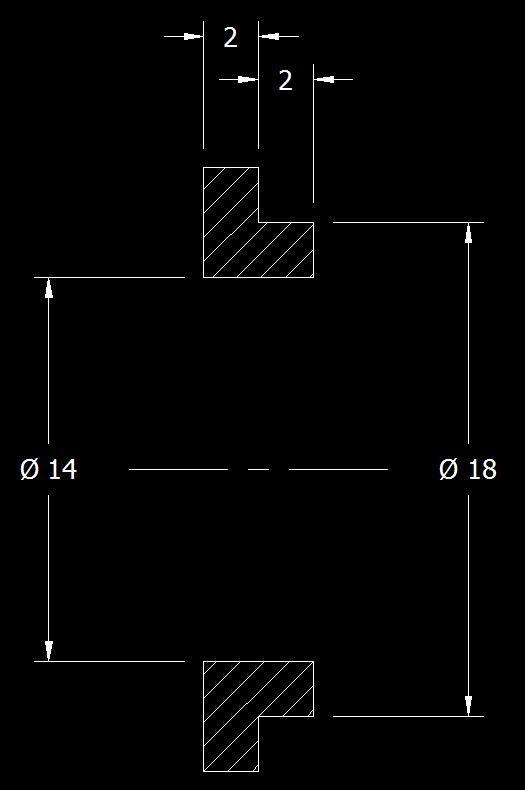 Then you'll need to file the flange portion so its 2mm thick (you need two bushes for each part of the 'UJ' you're working on). Finally, cut the bush down to approximately 4mm long. When you look inside the original bush, there's a steel tube with what appears to be rubber bonding it to the outer tube. The recess the 14x18x2 part of the bush fits into is a fairly arbitrary figure so if the bush doesn't fit all the way in, you may need to file a little off the end so its sits nicely in. Adjustable pliers help force the new bushes into the 'UJ'. If the assembled 'UJ' doesn't fit into the yoke with firm hand pressure, DO NOT FORCE IT IN. I did to begin with and it made the gearstick tight and it didn't self-centre. A little adjustment to the bush so it fitted better and everything slid together beautifully and wasn't too tight. Between doing this mod and fitting a new gear linkage stabiliser bush, my gear change has gone from a very imprecise, rubbery feel to something like loading a high powered sniper rifle. Not a bad result for less than £30 for the stabiliser bush and a packet of these Nylon ones so I'm a happy bunny! The tomei short shift kits feel like a rifle bolt lol . few better bushes and solid damper and decent return springs and you shooting gears with beautiful feel . Can we add this to the how to's/guides section? This would be really useful to quite a lot of owners. 13 Re: A few dimensions please?